Satanists are trying to get the Oklahoma legislature to allow them to install a statue of Satan after they allowed one of the Ten Commandments – and the group hopes to do so in other states as well. In January the Satanic Temple announced plans to erect a monument glorifying the Dark Lord on the front lawn of the Oklahoma Statehouse. An Indiegogo campaign was launched with what seemed like a somewhat lofty goal of $20,000, but by the time donations ended almost $30,000 had been raised. Now an artist trained in classical sculpture is toiling away in New York, crafting Baphomet figure sitting beneath an inverted pentagram and flanked by two children gazing upward in loyalty. 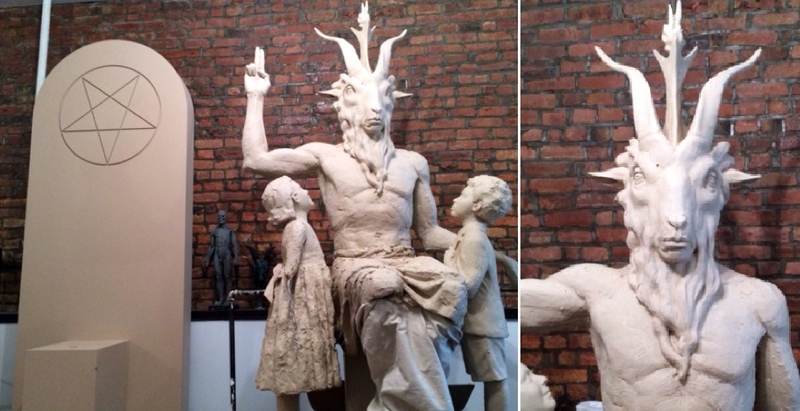 When it is finished, it will be cast in bronze and, the Satanists hope, eventually displayed in Oklahoma. That’s what you get when you impose relativistic values on a nation. These people are like whiny little children screaming, “it’s not fair!” Well, it kinda isn’t – the United States was founded with a secular government, but with a tacit Judeo-Christian underpinning. Let’s hope the whiny children aren’t able to take over our government.